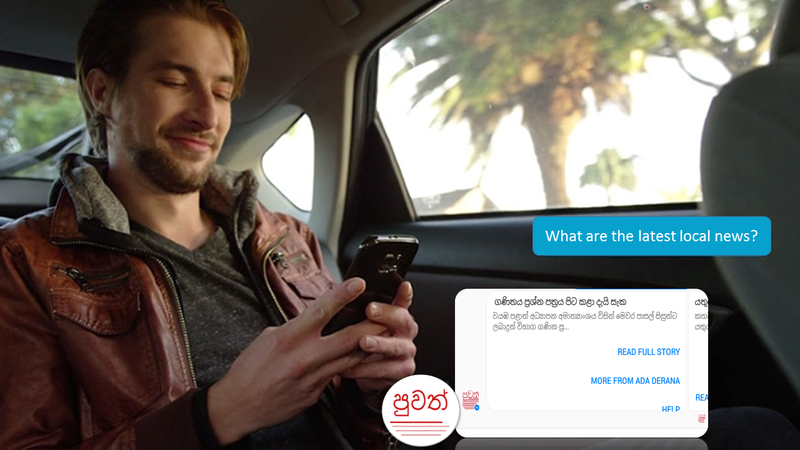 Chatbots කියන්නේ සාකච්ඡාමය පරිශීලක අතුරු මුහුණතක්(Conversational UI) හරහා භාවිත කල හැකි මෘදුකාංග යෙදුමක්. මේ Chat Bots වලට දීර්ඝ ඉතිහාසයක් තිබුණත් මෑතකදී තාක්ෂණික ලෝකයේ කතා බහට ලක් වුනා. ඊට හේතු වුයේ Microsoft සමාගම සහ Facebook සමාගම අලුතෙන් Chat Bots සඳහාම Platforms/Frameworks දෙකක් හඳුන්වා දීමයි. Microsoft සහ Facebook හි මේ Platform දෙකම දැනට Preview තත්වයේයි පවතින්නේ. 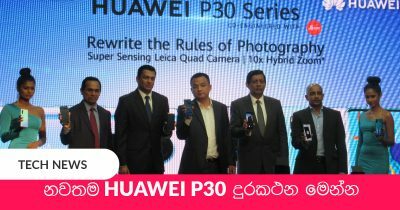 මේ සමාගම් දෙකම තරඟකාරීව තම නව අංග ඉදිරිපත් කරමින් සිටිනවා. මේ Platform දෙක අතර තිබෙන ප්‍රධාන වෙනස්කම තමයි Microsoft Bot Framework එක භාවිතා කර යෙදුමක් සැකසුවහොත් එය Bot Connector එක හරහා Facebook Messenger, Skype, Slack, Telegram ආදී IM Channels රාශියකට ඉතා පහසුවෙන් එක් කල හැකි වීමයි. Slack සතුව මිලියන 3 කට අඩු සක්‍රීය පරිශීලකයන් පිරිසක් සිටිනවා. Microsoft Skype හි එම අගය මිලියන 300ක් පමණ වෙනවා. නමුත් Facebook Messenger සතුව මිලියන 900 කට අධික සක්‍රීය පරිශීලකයන් පිරිසක් සිටිනවා. ඒ වගේම Whatsapp සහ Instagram යෙදුම් දෙකත් පවතින්නේ Facebook පාලනය යටතේයි. ඒ අනුව වැඩිම පරිශීලක පිරිස Facebook සමාගම සතුවයි පවතින්නේ. 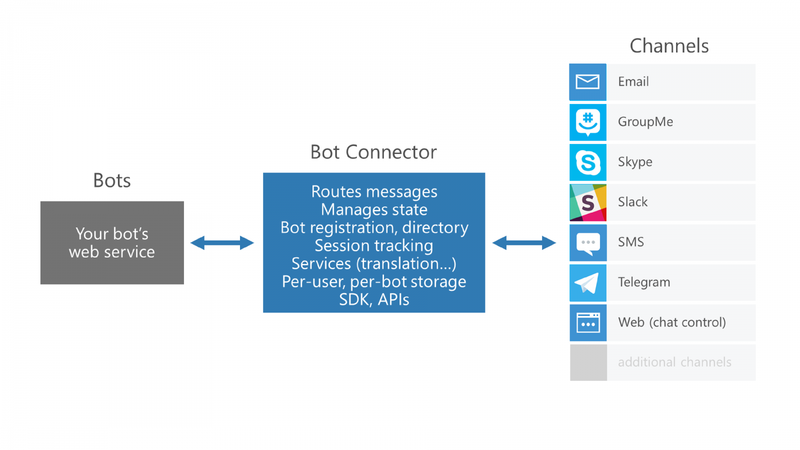 ඒ නිසා Microsoft Bot Framework එක භාවිතා කරන developers ලා හට මේ Bot Connector එක ඉතාම වැදගත් වනවා. Facebook Bot Engine එකෙහි මුලික පදනම වන්නේ Facebook සමාගම මෑතකදී මිලදී ගත් wit.ai. wit.ai කියන්නේ natural language processing engine එකක්. මෙය ඔබගේ අවශ්‍යයතාවයට අනුව පුහුණු කරන්න පුළුවන්. Microsoft සමාගම සතුවත් මෙවැනි engine එකක් තිබෙනවා. එය නමින් LUIS(Language Understanding Intelligent Service). LUIS.ai සහ Facebook Bot Engine යන natural language processing engines දෙකම පවතින්නේ වෙනම සේවාවන් විදියටයි(Standalone web services). ඒ නිසා Facebook Messenger Platform එක භාවිත කරන bot යෙදුමක backend එක විදියට LUIS යොදා ගන්න පුළුවන්. ජූනි මාසය අගදී Facebook සමාගම නිකුත් කල වාර්තාවට අනුව මේ වන විට Facebook Messenger වෙතට Bots 11,000 කට අධික ප්‍රමාණයක් එක් කර තිබෙනවා. Puwath Bot කියන්නේ, Microsoft Bot Framework එක යොදාගෙන නිපදවා තිබෙන Bot යෙදුමක්. ඔබේ ඕනෑම උපාංගයක එක ලෙස භාවිතා කරන්නට පුළුවන්. අමතර මෘදුකාංග install නොකර දේශීය, විදේශීය, ක්‍රීඩා, තාක්ෂණික, විචිත්‍ර ආදී නවතම පුවත් සිංහලෙන්ම Facebook Messenger හරහා ලබා ගන්නට පුළුවන්. ඔබට කරන්න තිබෙන්නේ m.me/puwathbot වෙබ් ලිපිනය හරහා Puwath Bot සමඟ Chat කිරීමයි. එහෙම නැත්නම් මේ Facebook පිටුව Like කරලා එම පිටුව සමඟ Chat කිරීමයි. පහත වීඩියෝවෙන් මේ පිළිබඳව අදහසක් ඔබට ලබා ගන්නට පුළුවන්. Weather Bot කියන්නෙත් තවත් bot යෙදුමක්. මේ හරහා ඔබේ නගරයෙහි හෝ ආසන්නම නගරයෙහි කාලගුණ වාර්තාව සහ ඉදිරි දින සඳහා කාලගුණ අනාවැකි ලබා ගන්නට පුළුවන්. 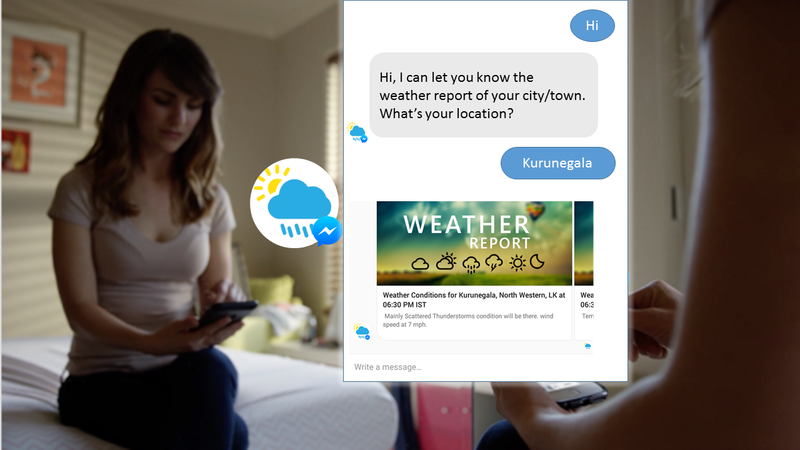 m.me/weatherbotlk වෙබ් ලිපිනය හරහා Weather Bot භාවිතා කරන්නට පුළුවන්. තවත් මේ වගේ bot යෙදුම් භාවිතා කරන්නට කැමති නම් Botlist වෙබ් අඩවිය ඔබට උපකාරී වේවි. Facebook වෙතින් අමුතුම app එකක් නිකුත් කෙරේ.